We provide roll-off recycling dumpster rentals for your commercial or residential project of any size. We have containers available in 20, 30, and 40 yard sizes. We can judge the size you need by the size of your project. 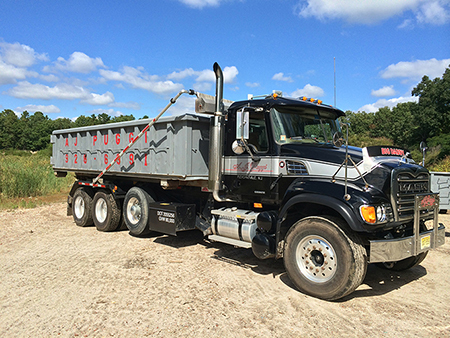 We service recycling dumpsters for business and residential customers throughout New Jersey. Give us a call today to set up your dumpster rental. If your construction or renovation project requires major clean up, our roll-off dumpsters are the perfect solution. We offer a range of dumpsters that can handle broken concrete, asphalt, construction or demolition debris. Please call to find out our availability for container rental. See the table to the right for specific container dimensions. A 20 yard dumpster is designed to hold 20 cubic yards of waste. This open-top dumpster size is a good size for a kitchen or bathroom remodel project. A twenty yard dumpster will hold approximately 300 square feet of deck debris from a decking project. This dumpster bin is a good size for a 2 car garage clean-out. A 30 yard dumpster is a good size for foreclosures, evictions and estate clean outs. Thirty yard dumpsters can hold 30 cubic yards of waste. They are ideal for roofing removal, demolition debris and basement clean outs. A 40 yard dumpster is the largest size dumpster for rent. A forty yard dumpster holds 40 cubic yards of garbage waste. 40 yard dumpsters are ideal for large clean outs, large construction and remodeling projects.